I keep forgetting to post this so before I forget again....here is the Ar build we did with a garage sale lower and assorted collected pieces that were not cool enough for the "in" Ar crowd I guess. "operation pea shooter"
The Barrel is a Shilen Match grade bull model 18" in length. The brake I built myself, and well the rest is mostly self explanatory. Including the Vortex scope, and NB bolt carrier just as you see it and 4 P mags... we have $717.00 invested. When more motivation strikes me, I will finish the .458 So Com upper we are doing for it and call our AR platform experiment done. I need about 4 hours yet on the lathe and the .458 barrel will be done...so shouldn't be too long. I should be right at $640 for the .458 upper complete. As a truck gun it's growing on me... but I will be much happier when it's dressed as a .458 in the trucks gun rack. And I may spring for a nice trigger at some point, but so far this trigger isn't as bad as I had thought it would be after some massaging. We have made no real attempt at any "fancy" target shooting but it's got a fair amount of rounds through it at 75 yards or so off our front porch...it has no issues shooting nickle sized groups on cheap ammo. Being the pea shooter it is...not sure what besides paper I'd shoot with it anyway until it's wearing that .458 upper and actually useful. That does look good. You're giving me ideas for using the new lathe..hmm. I am happy with the cost/performance aspect of this. The scope is fantastic in low light, it's very easy to use with two eyes on the lower powers for quick target acquisition. When the .458 is done it will be a excellent tuck gun with "any varmint" capability. How do you like that vortex? It is the comparable one to Nikon's P223 right? I have been thinking about giving one a go on one of our ARs. Also, I really like the brake, makes me wish we had a permanent living arrangement where I could actually set up a shop. Nice Norm. Did you chamber the barrel and cut the threads for the barrel extension? I've tried cutting threads a couple times, and let's just say, well, I won't be trying it on a barrel anytime soon! I forget the model # on that Vortex. I will take a look next time I am near my pickup and post it. As for how I like it...I bought it used off a guy who decided he needed a more tactical looking device or something. I was at the gun store hanging out and this fella walked in and got to looking at stuff and in the end I bought the scope/rings off his gun he has shot 30 rounds out of maybe on the spot. And he bought his new more tactical cool device he had to have. It gathers light very well, is crystal clear, and has proven to be very user friendly for multiple shooters. I no kidding just snapped it onto my AR and shot it...didn't bore sight it, nothing. A few clicks of adjustment it was dead on and life's good. Time will tell, but given Vortex's reputation I am sure it will prove to have been a good choice. Good to know about the vortex. I wish I had a gun shop were strange people showed up needing something cooler. Never happens to me, that's ok I suppose. And that gun shop you hang out at, must be an interesting place. First some guy challenges you and I'm sure other things have happened while you were in there between then and now. And now some guy was upgrading his tacticool, and you got a nice scope. Wasn't the same guy was it? That Vortex looks like the PST 1-4x. But I can't get the pic to cooperate when I try to zoom, so it's a guess. What reticle is in it Norm? Looks great Norm. How did you finish it? That is perfect for all those little varmits. Don't have to be a big round at 3000fps. Keep it as it is and build another for the 458. Threads aren't hard, they just take time. The barrel/brake are parkerised to match the lower/upper which I also bead blasted and had redone. It's nothing fancy, just functional. It just got a Geissele Two stage trigger I scored for $125 used. Which is MUCH better than the massaged mil spec I had in it. We had it out last night for a while testing the new trigger, and my wife was ringing steel at 400 yards effectively with a 5mph cross wind. Some day when I get time I will bench shoot it and see what it can do..but given how it shoots just laying it over the pickups hood...I am happy. As for building another AR...I have considered it. But to me the most attractive aspect of the AR is the ability to swap uppers and have the caliber choices. The 5.56 62Gr is handy for gophers, and small game...it's great for badgers and stuff. It's fun for banging steel economically, and in a pinch can handle deer/coyote just fine. The .458 is the workhorse and the round of choice for everything from a pesky coyote, to hogs, to well anything ya don't want breathing after you pull the trigger. I am sure it will spend 99% of the time wearing the .458 upper. 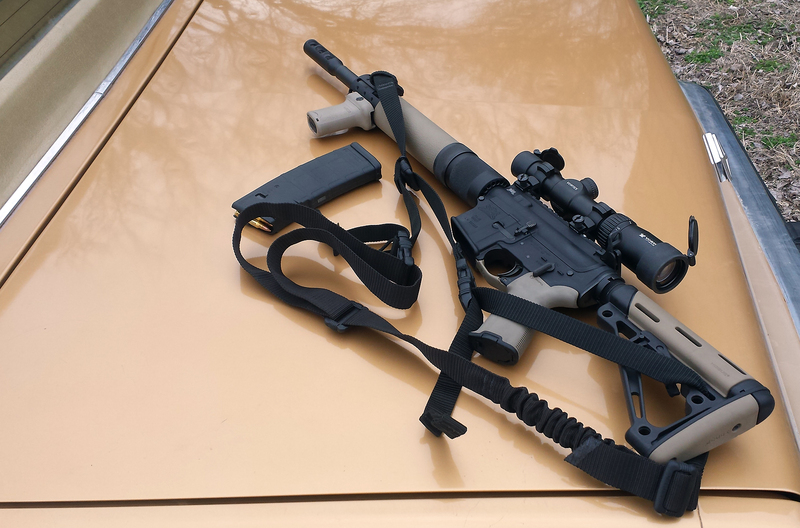 To elaborate a bit: If the terrain I was shooting was open air, flat, I'd likely just make the 5.56 get the job done. It's certainly capable of most shooting with proper shot placement. But it's not a good choice in tall grass, brush, on the fast moving targets I typically deal with. Over the years despite much "flak" I get from many people I have proven time and time again that the 45.70 gets the job done regardless. Small twigs/grass don't even bother it so when chasing a coyote through a river bottom while standing 250 yards away is not the place for small light rounds with optics. Your going to get one shot, it likely will be less than ideal, and my old 45.70 Lever gets it done. So the idea behind this build is an attempt on my part to "update" a little. More rambling: A year or so back my oldest kid built a AR for plinking and he had it out one night Coyote hunting. We had lost a calf to Yotes and it was time to trim the pack down some again. We were sitting as we often do on the hood of the pickup waiting and watching the valley/river bottom with glass. We spotted a fast moving yote on the rivers edge on the canyon bottom and my son shoulders the AR and fires. He missed, sec shot he hit but the brush must have caught the bullet as it smacked the yote in the rear quarter and spun him. He was up and running on three legs and now in the prairie grass. I shouldered the 45.70 and took my shot. You could see the grass part as the bullet flew and we now had two hunks of coyote, and red grass. Time and time again I have seen where the smaller calibers although fast and long reaching just don't have the real world usefulness in the conditions we deal with. Nebraska always has wind..we are often usually shooting down into a canyon/bottoms covered in 5' grass, locust, and wild grapes/plums...the canyons winds, the brush don't bother that 45.70 all that much. Also we often have to shoot down corn rows... again the little 5.56 is disturbed badly by corn leaves and such... again the 45.70 just plows through rather effectively. Now where the lil AR has it's value is those days when I get ornery with the badgers that like to tear up my river banks, terraces and other things I then have to fix. I can sit on my truck hood and snipe badgers at 200 yards or more across the valley and not spend $2.50 a shot for the privilege. With a suppressor/optics this will be a fine badger eliminator rifle. The 45.70 makes enough noise you only can get one at a time. Similar deal with ground hogs, although I often let them be unless they get too populated. So anyway the logic is one rifle, one extra upper = versatility. It all fits behind the seat easily, or on the dash if not in town LoL I can switch uppers depending what I need to do/select the correct magazine full of ammo and get the job done. I can let the gun wear open sights and the .458 most times, and drag out the lil fella with optics for other chores. Guess your guy does the parkerizing too, nice work. Doesn't the 458 cost you some range? A nice big round, but give and take. 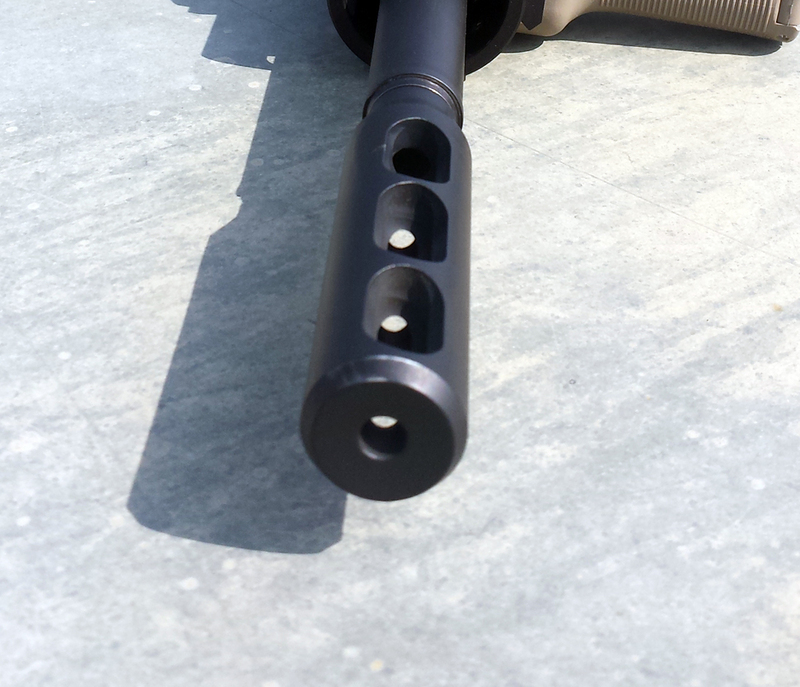 Have you ever thought about the 300aac? Works with everything AR, just a barrel change. I have always wanted a 45-70 lever gun, octagon barrel. I have a ol 3030 that has served me well through a few seasons. Yes I did consider the .300aac briefly, it just doesn't show any advantage to the .458 and gives up a lot in my application. The cost of the upper build is identical. Also for me to swap back and forth between calibers quickly I need a complete upper. Barrel cost, upper cost, bcg is all the same. I may someday build a .300aac suppressed SBR or pistol for goofing around, but right now I am focusing on reorganizing my guns into two categories. Tools/collectors and the rest are going/gone. I have yet to be convinced the AR platform is going to work for me, but I am giving it a chance. I get my Parkerising done by a gentleman semi-local here who has a business of doing such stuff for commercial parts he manufactures. He will do gun stuff for me if I ask him nicely, so it works out pretty well. In a few weeks we will have a semi local fella doing cerekote also...not sure If I have much use for that, but ya never know. I always liked the 45-70 round myself.